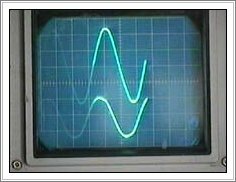 Believe it or not, nearly everyone you know has at least one induction generator and probably more That's right! You say that is impossible... well, read on! 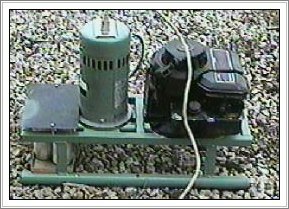 Within every home there are motors that can be operated as generators. They may not be labeled as generators, but they will function just the same. These motors are offen called "squirrel cage motors" and are in washing machines, dryers, water pumps and other devices too numerous to mention. OK, what is so great about it? There is nothing complicated about the conversion, no weird rewiring, no complicated math...nothing! There are no brushes to wear out. 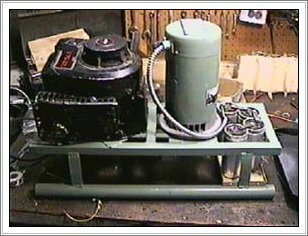 A motor converted to an induction generator will not start another squirrel cage motor unless that motor is about 1/6 of the horsepower of the induction generator. In other words, a 1 horsepower motor used as an induction generator will start a 1/6 horsepower or less, squirrel cage motor. Output Capability: This Induction generator has an no load voltage of 125.9 VAC at 60 hz. The generator successfully powered 1050 watts of lightbulbs with a voltage drop of 10.9 VAC to a full load voltage of 105 vac. During the power test, the generator was driven by a 1.5 horsepower electric motor and there was a loss of RPM when the load was increased. I attribute some of the voltage drop to this lack of driving power. Nearly all the B&S engines that are used on lawn mowers with a direct connected mower blade depend upon this blade to act like a second flywheel for the engine. They have a primary aluminum flywheel inside the engine cover. The aluminum flywheel does not provide enough inertia to work without the blade. The symptoms are backfiring, jerking starter rope and difficulty in starting. You will probably have to change the aluminum flywheel to a cast iron one. The cast iron ones are pretty common in horizontal engines that are used in rototillers, etc. Usually junk yards or small engine shops will have them. However, if the generator rotor has enough mass, it may have enough inertia to keep the engine running fine with an aluminum flywheel. Just experiment. Also, make sure the magnet matches the one on the original flywheel; they have either one or two magnetic poles which are very obvious by sight. The small gas tank on these B&S will give you at least an hour of power. If you need longer running time, then find an engine with a larger gas tank. A gallon tank will give you lots of time with a small engine, probably over 6 hours or so before refueling. Check oil levels at each gas refill, etc.